I'm a liar. Such a good liar that I don't even know when I'm lying. 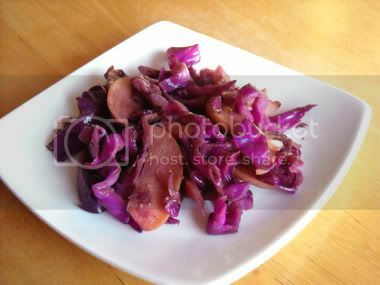 In an earlier post, I told you I hadn't taken pictures of the cabbage and apples I made for brunch. But looking through my camera, I realized I was wrong! I'd seen this on Melissa D'Arabian's 10 Dollar Dinners. I've never been a fan of cabbage. Like brussels sprouts, it's just not yummy. I usually avoid it in salads, fish tacos, wherever else it lurks. But she swore that everyone she'd ever served it to looooooooooooved it. So why not try it? The first time, I didn't have fennel so I used cumin. The second time, I forgot about the cumin/fennel completely. And it didn't even matter (I use the Adobo with cumin in it, so it was there, at least). Original recipe here, modified below (basically I switched out the Granny Smith for a Golden Delicious--they're sweeter--and used my handy Adobo instead of salt & pepper). Core and slice the cabbage into thin slices. Slice the cheeks off the apples and cut into thin wedges. In a large saute pan, add the butter and melt over medium heat. Add the cabbage, apples, and Adobo, to taste, and saute until the cabbage softens and wilts, about 20 minutes. Deglaze with red wine and stir in a splash of cider vinegar. Transfer to a serving bowl and serve. When all was said and done, my house smelled like wine and butter. In other words, decadent. And quite yummy. I'm a cabbage convert! But I still hate brussels sprouts. I had invited my parents over for brunch and I wanted to keep it light. I actually made more than this (including pork medallions with sauteed cabbage and apples) but I forgot to take pictures. Oops. Again. This is the type of dish you may find at some Mexican restaurants, the kind that don't serve chips and salsa as the freebie starter. We used to have one here in Culver City--and not to name drop, but I once ran into Jed the Fish there, his voice is unmistakable--but they tore it down and made it a nouveau Mexican chain restaurant instead. I'm guessing they abandoned the jicama for chips. It's what Americans expect, after all. This is even simpler than the chocolate hummus because all this requires is a peeler and a knife. Or a mandoline, but I didn't have one at the time. 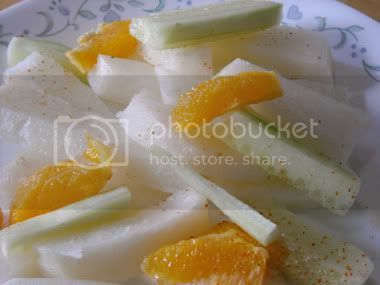 Peel and cut the jicama and cucumber into spears. Peel and section the orange. Sprinkle the chile lemon salt over the entire plate, to taste. Serve immediately, or chill in the fridge. My mother, who is originally from Guadalajara, Mexico, has always referred to this as pico de gallo, which perplexes people who are used to the tomato/onion/cilantro concoction you find in American restaurants. Wikipedia explains the subtle differences. My friend Alexandra had been following my cooking adventures via Facebook updates and requested that the next time she was in town, she get to partake. She's is a vegetarian, which lent itself well to my favorite: Indian food! I'd made palak paneer on several occasions, but had never been able to get the seasoning quite right. This time around I doubled what the recipe called for, and even still Alexandra felt it could use more. Plus, she likes things spicy. We also had the scotch & cheddar fondue, again. I'm really loving that recipe. And Alexandra had just been in Scotland, so it fit. 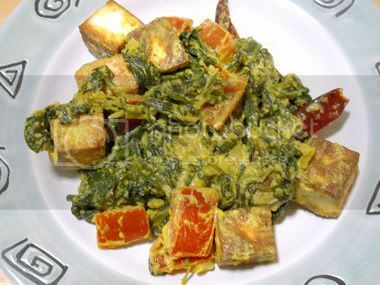 Palak Paneer is just spinach cooked with delicious Indian spices, paneer (an Indian cheese similar in texture to tofu), and some vegetables. It's perfect for vegetarians. The All Recipes listing calls for ricotta. If you can't find paneer at your local Indian grocer, you can use ricotta or even tofu. The taste won't be wildly different. I followed the recipe exactly the first time I made it, but it came out kind of bland. The next few times I played with the ratio of cumin, turmeric, and coriander--even added salt (plain salt, not my trusty Adobo!). It was always just okay. This round, as I mentioned above, I doubled the spices. The taste was still not "right." It's good, but I want a little more heat, a little more flavor. So this will definitely return for a another round at some point in the future. There are plenty of variations of this recipe all over the internet. If you decide to experiment with this, please comment and let me know how it turned out for you. Yes, chocolate hummus. It sounds weird, kind of disgusting, but it turned out to be quite yummy. Like pudding. 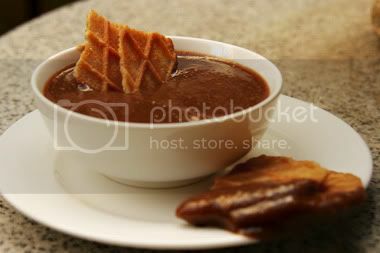 It started with a quest to find a savory chocolate recipe to use at the chocolate SNTK. When I finally found it, I couldn't wait for the test kitchen. I had to do it right away, by myself. There is nothing difficult about this. You stick all the ingredients in a blender, mush them together (it's a technical term) and you get a thick, slightly lumpy concoction. Eat it with cookies! Puree in blender. Serve with cookies or as a crazy dipping sauce for celery. For the second official [Sunday Night] Test Kitchen, I was all over the map with the food. But I managed to tie it together, if loosely, with an Asian theme. Kind of. Sort of. My brother Erik, sister-in-law Zareena, and 2 year old nephew Baby Aladdin played the judges. Well, my nephew didn't really participate, but he did offer entertainment with his Mr. Potato Head.